Le voyage à travers le temps d'un homme amené à réfléchir sur les thèmes de l'amour, la mort et l'immortalité. mais finalement, IL EST LA !!!! Darren Aronofsky proved himself a filmmaker to watch with his provocative debut, Pi. His follow-up, Requiem for a Dream, continued the accolades, receiving Golden Globe and Academy Award nominations. 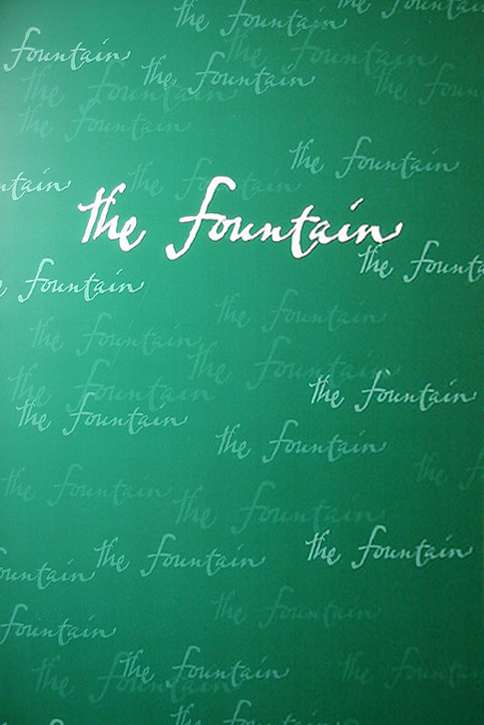 His latest accomplishment, however, comes straight to comics in the form of The Fountain, a gorgeously painted, oversized original graphic novel about the timeless truths of life, love and death. Working with acclaimed painter Kent Williams (Blood: A Tale, Destiny: A Chronicle of Deaths Foretold), The Fountain crisscrosses through three distinct time periods: 1535, during an ancient Mayan war; the present day, following one doctor's desperate search for the cure for cancer; and the far future through the vast exotic reaches of space. Interweaving these three periods, The Fountain follows Tomas — warrior, doctor, explorer — as he feverishly tries to beat death and prolong the life of the woman he loves. A story so grand, one medium couldn't contain it, Aronofsky's feature film version of THE FOUNTAIN will be released by New Regency and Warner Bros. Pictures, starring Tony-award winning actor Hugh Jackman (X-Men, Van Helsing,The Boy from Oz) and acclaimed actress Rachel Weisz (Constantine, The Mummy, the upcoming The Constant Gardener). But before he did, the filmmaker wanted The Fountain to be realized in the unique storytelling power and artistic beauty of the graphic novel. Together, Aronofsky and Williams deliver what might be considered the ultimate director's cut. This volume also features an afterword by Aronofsky. Ce film est probablement celui que j'attends le plus en 2006 ! Raaaahh il me tarde ! Et Brad Pitt n'est qu'un idiot ! 'Tain mais t'es fou ! Je bande là ! C'est magnifique ! C'est Hugh Jackman sur la photo? Je suis vraiment pas physionomiste. right hand of doom a écrit : C'est Hugh Jackman sur la photo? Sinon il y a une date annoncée pour le film?